Construction on the house at 2118 Ruffin Street was begun in 1946 and it was completed in early 1947. It was one of more than a dozen houses being built at the same time by the developer of Glendale Heights, Rental Realty Company. Like all the early homes in the subdivision, it was built for Word War II veterans in the Minimal Traditional style. Although this house and its neighbors were all built to strict standards developed by the Federal Housing Authority to qualify for government loan programs, there was no contemporaneous name for their architectural style. Later, when the shared characteristics and social history of the houses became the subject of study, the collective term “American Small House” was used for a time. That name proved to be insufficiently descriptive, however, and Architectural historians eventually settled on “Minimal Traditional” term we use today. For its Glendale Heights subdivision, Rental Realty Company used stock house plans drawn without reference to lot sizes or site conditions. Instead, the lots were laid out to receive the houses. 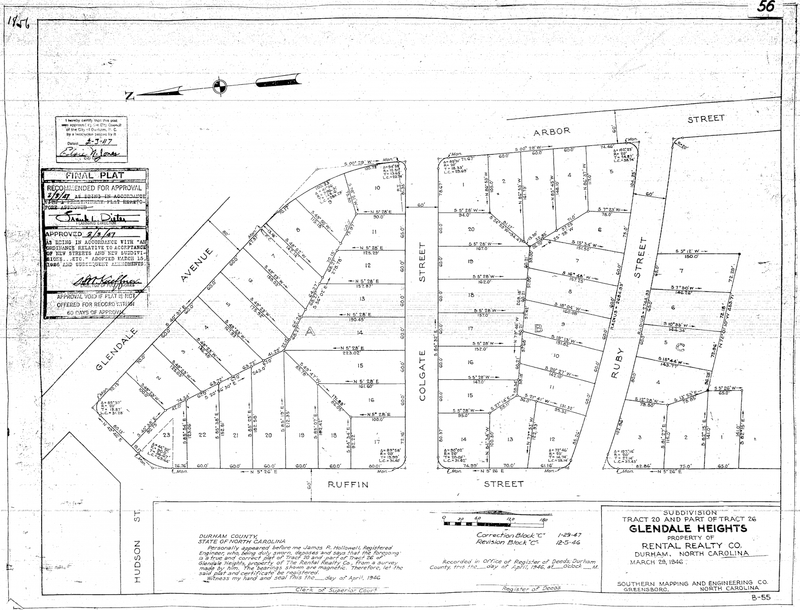 1946 Plat showing the subdivision of properties in this part of Glendale Heights. 2118 Ruffin is the wedge-shaped lot near the bottom left (County Register of Deeds). In the early phases, like the one that includes 2118 Ruffin, just four or five plans are evident. The company clad this house with wood and that one with brick, but no expert eye is needed to see the repetition in design. Regardless of plan, all of the houses are one story. All have simple massing. There are no deep roof overhangs, no elaborate front entries, no wraparound porches. To the extent that there is any historical reference at all, the tendency is toward American Colonial Revival. The front doors are paneled. The sash windows are divided in a six-over-six pattern. Small size and simplicity in design did not mean cheap materials or cut corners. The houses were built to high standards. They had oak floors, plaster walls, up-to-date appliances, central heating, and modern plumbing and electrical services. The government demanded high quality as a condition of making materials available. The construction industry chafed at the standards and the price limitations the government imposed. The house at 2118 Ruffin was something of a wedding present. Thomas “Tommy” Hay bought it on March 27, 1947. He had married his sweetheart, Bonnie Blalock, only two days before. Like all the early purchasers in Glendale Heights, Tommy was a veteran. He enlisted in the U.S. Army soon after the attack on Pearl Harbor and served in the South Pacific. When he was released from service in 1946, he returned home to Raleigh where he and Bonnie met. Tommy opened a real estate business in Durham and quickly rose to prominence. He was president of the Durham Board of Realtors by 1952. He bought and sold blocks of lots in later phases of the Glendale Heights subdivision, including those on the side of Ruffin Street opposite his home. The Ruffin Street house is a three bedroom Minimal Traditional similar in plan to the house at 616 Colgate – also on today’s tour. Where the house on Colgate was sided with wood, the Ruffin Street house is clad with brick. The house was designed with the entrance on the end so that the plan could be rotated 90 degrees to fit on a narrow lot. The massing is simple. The façade is unadorned. In the main block of the building, two pairs of sash windows are arranged symmetrically. On the right, a subordinate wing extends eastward. A screened porch in a similar wing balances the western end of the house. 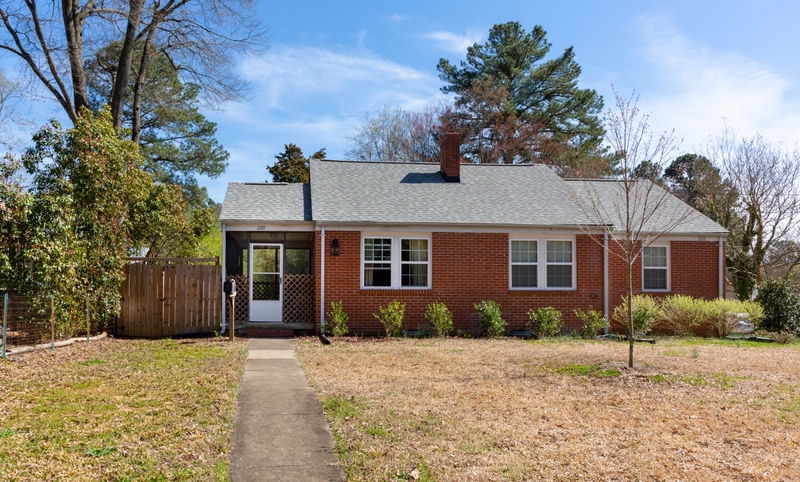 The plan of 2118 Ruffin is little altered from the time the house was built, but the interior finishes and fixtures of the house have been renewed. The original six-over-six sash widows have been replaced with modern windows in the same pattern. More recent owners have done away with the original window casings. The fireplace mantel, though a replacement, is in a traditional style like the original. The original doorway between the kitchen and the dining room has been opened up. The kitchen itself has been remodeled. The bathroom also has been remodeled, but it retains the original steel tub. The utility room addition on the back of the house is connected by the original back door. Throughout the house, the oak floors are original. In the hall you can barely tell where the original floor-furnace grates were removed and floored over. The Hays lived at 2118 until 1955. They sold the house to Brantley and Margaret Brock. Brantley Brock was a chemical engineer at Liggett & Myers. During the war he had served with the Army Air Corps. John and Pauline Gregory purchased the house in 1964 and lived in it until 1981. Mr. Gregory was a superintendent with General Telephone. After the Gregorys, the house was occupied by a succession of rental tenants until the current owners moved in in 2017. That the house remains so little altered after seventy years is a testament to the durability and practicality of its original design.